Driving Controls, Steering Devices, Tie-Downs, Lifts, Option Controls, Specialty Controls, Specialty Seating, Custom Interiors, Grab Handles, Running Boards, Alarms/Car Starters, and more. 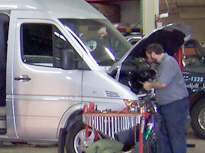 Most of the new equipment we install qualifies for the "Mobility Rebate" that many Manufaturers offer on new vehicles. We also install customer owned equipment, and used equipment. Our talented installers are willing to install other types of equipment also. If there is something you need installed, feel free to give us a call and come in, we'll be glad to give you a quote. If we can't do it, we'll at least point you in the right direction. Routine maintenance is essential to promote the longevity of your mobility equipment. At CCI, our certified technicians are equipped to efficiently diagnose and repair all brands of mobility equipment, as well as provide preventative maintenance inspections. To make an appointment for service or general maintenance, please contact CCI at (800) 539-7237. Whatever mobility equipment is installed in your vehicle, we can help. Bring your equipment in and see for yourself. CCI can customize your vehicle to fit any of your individual needs. We'll actually listen to you and then help you decide what equipment or modifications are best for your unique situation.